Please read The Analysis of Subproblem D before reading this page. The root cause analysis was so deep and comprehensive it simultaneously identified the root cause, its high leverage point, and its required solution element. This is potentially good news because it eliminates speculation about what's the best solution to resolve the root cause, if the root cause is correct. The analysis model of the root cause thus includes its own solution, as shown in the causal loop diagram shown later below. The heart of the solution is stewardship corporations. The sustainability problem arose from the way large for-profit corporations, due to their top goal of profit maximization, think only of themselves. To solve the environmental proper coupling problem we need stewards, whose chartered mission is to take care of the common good in some specific manner. 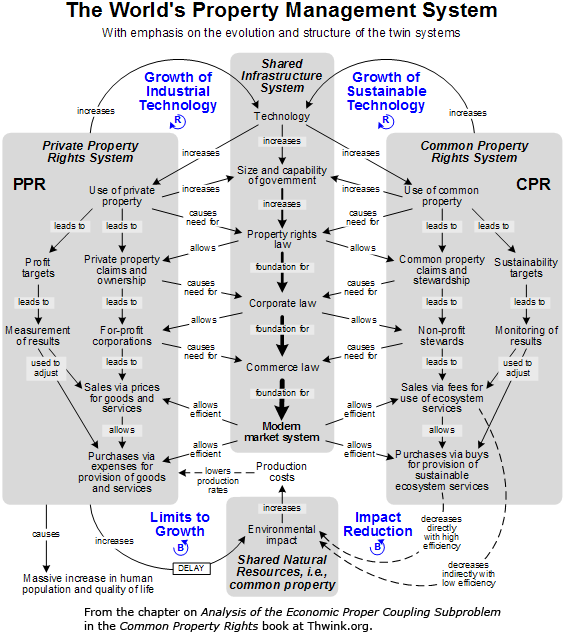 The Common Property Rights solution element formalizes and thus greatly strengthens the system (CPR) on the right of the diagram. Note that Common Property Rights strengthens rather than creates the CPR system because the system is already there. It's just too weak to be efficient and effective. 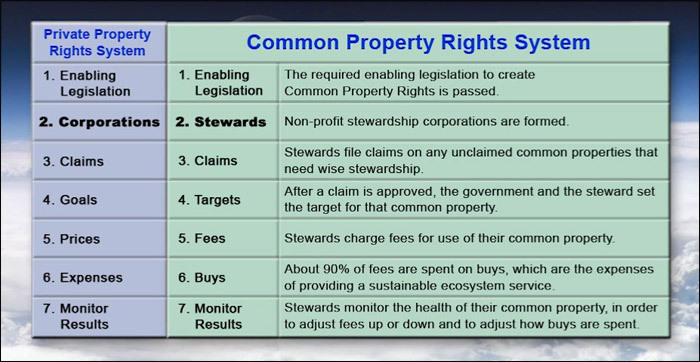 Common Property Rights can also be called Common Property Management Rights, since the key right is the right (and responsibility) to sustainably manage a common property for the good of all. This clean dichotomy allows The World's Property Management System to be diagrammed as easily as one traces the skeletal structure of a butterfly. The two wings share a central body. If either wing is weak the butterfly will have trouble flying. It will be unhealthy and have a short life. Click the diagram to show or hide the butterfly. Here's the full size diagram. The wing on the left, the world's Private Property Rights System, is so strong it gave us the Industrial Revolution. But we now know that came at a hidden and delayed cost. Due to the Limits to Growth feedback loop the system requires a strong right wing as well. Without a robust Common Property Rights System, the overall system will continue to be like a butterfly with one wing, spiralling downward to its doom. But if we can make the right wing as strong as the left wing, the system will give us the Sustainability Revolution. The butterfly will fly onward into the future with grace, dignity, and quality of life for all. Tracing the causal chain of the subproblem's symptoms lead to construction of the model shown above. The model contains extremely useful insights. In particular, it explains why the economic system is improperly coupled to the environment. The reason is subtle. It's because the transaction costs of performing the needed actions in The Common Property Rights System are so high they are unaffordable. That's the root cause. This leads to weak Growth of Sustainable Technology and Impact Reduction loops. The main root cause of improper coupling between the economy and the environment is high transaction costs for managing common property sustainably. Economists define transaction costs as the cost of using the price mechanism, which excludes the production cost of the product or service sold. The Common Property Rights System is fee based, just like the Private Property Rights System is price based. Common property transaction costs are expenses like lobbying to get new environmental laws passed, campaigning to get support for those new laws, and educating the public on how to follow the proper practices needed to live sustainably. Without a strong Common Property Rights System these transaction costs are so high that public interest activists can't afford them. The exact reason common property transaction costs are so high is because they can't be conducted inside of a corporation (such as a steward, see below) that specializes in managing common property sustainably. Since transaction costs are high environmentalists, no matter how hard and long they try, cannot "push" on the system enough to solve the sustainability problem. They can't shift the system into a permanently sustainable mode. It's like a car forever stuck in first gear. The high leverage point for resolving the root cause is allow firms to appear to lower the transaction costs for managing common property sustainably. To design the solution element for pushing on the high leverage point, we must answer several key questions: What kind of firm is needed? What should be their goal, constraints, and business model? All of these questions are easily answered by examination of the model since analogous questions and their time tested answers appear in the Private Property Rights System. Every question we have about how to design the system on the right (CPR) has already been answered by the system on the left (PPR). It's as if to solve the problem all we have to do is listen closely to the voice of nature. What is that butterfly trying to tell us? The second video works its way to the frame below. This summarizes how the solution element works. It all starts with the right enabling legislation. As you read about the seven components, notice how similar the two systems are. In fact they are identical, except for the way one system manages private property while the other manages common property. The same symmetry that nature finds so useful to achieve economy of motion in system design (via random evolution) can be applied to human made systems (by intelligent evolution). The world's Private Property Rights System revolves around corporations. Without corporations the Industrial Revolution would have been impossible. By analogy, the model tells us that without stewards the Sustainability Revolution is impossible. In other words, the Industrial Revolution is incomplete because The World's Property Management System is incomplete. It lacks strong Growth of Sustainable Technology and Impact Reduction feedback loops. 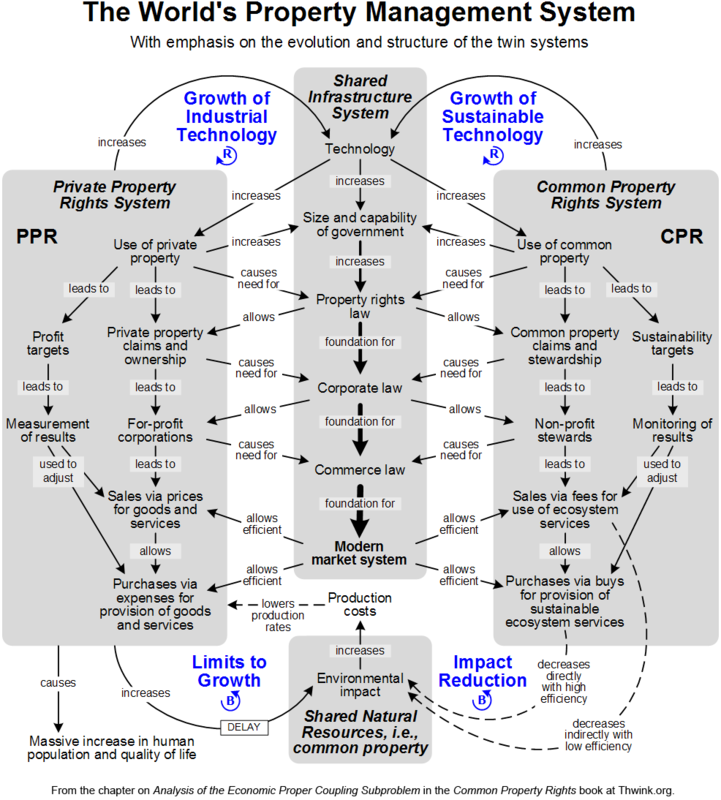 The model tells us the best way to create these loops is to promote the growth of a strong Common Property Rights System. Then	the	side	effects of the Industrial Revolution will be automatically minimized down to an acceptable level. This will make the system as a whole sustainable. The small model on the right summarizes how the Industrial Revolution works. The Industrial Revolution loop began when the modern large for-profit corporation appeared in significant numbers, enough to get the loop growing in earnest. The larger the corporations sector of society, the more goods and services produced. This increases profits. That in turn allows corporations to grow, and the loop starts all over again. We now know the Industrial Revolution loop produced massive side effects, like environmental, economic, and social unsustainability. This increases the sustainability gap, which is the difference between where we are today and where we need to be to be sustainable. The World's Property Management System model tells us there's a surprisingly simple way to bring those side effects (and hence the gap) down to an acceptable level. 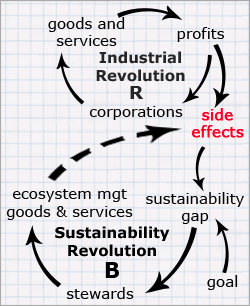 All we have to do is add the Sustainability Revolution loop, as shown below. 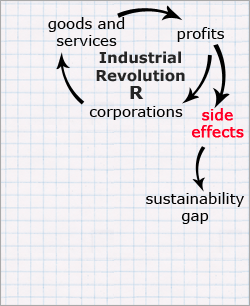 The Industrial Revolution loop is a reinforcing loop (R). No reinforcing loop can grow forever. They all have limits. If we do nothing to solve the sustainability problem those limits will eventually result in catastrophic environmental collapse. This can be avoided by adding the right balancing loop (B), which is the role the Sustainability Revolution loop plays. Like the way a thermostat balances the output of a heating or cooling system, the Sustainability Revolution loop balances the side effects of the Industrial Revolution loop. As side effects go down so does the sustainability gap, though this will take quite awhile due to the severity of the sustainability problem. Eventually, after several decades, stewards will reduce in number and/or size as the system settles into a sustainable equilibrium. The role of stewards at that point will be much like the infrastructure systems we take for granted today, like the judicial branch, the highway system, the police system, and the waste disposal system. Each system silent plays is required role in maintaining the health of the overall system. Today the sustainability gap is huge so we need lots of stewards. Since the gap is growing, tomorrow we will need even more. 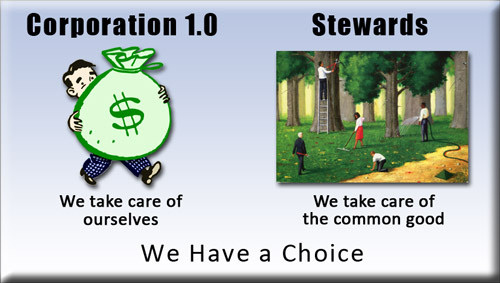 Steward growth will give us the strong Sustainability Revolution balancing loop we need. Once the loop grows strong enough the gap falls to a low acceptable amount, the sustainability goal is reached, and the problem is solved. The Common Property Rights System revolves around stewards. Stewards are a new type of corporation. The chartered goal of a stewardship corporation is to manage a particular common property sustainably for the common good of all. For example, one steward might manage the health of a river. Another would manage the health of codfish in the North Atlantic Ocean. A group of stewards would manage the many contributors to the climate change problem, and so on. This is identical to the way today's corporations manage private property. They have divided it up into separate pieces so that each piece can be efficiently managed. Stewards are non-profit or government owned since the stockholder profit motive creates an insurmountably large conflict of interest. Stewards have a monopoly. If they were for-profit they would tend to set higher fees in order to maximize profit and spend buys in a manner that maximized their own profit instead of minimizing future fees. By being non-profit and chartered with a public interest goal, stewards work for the long term common good of the people, rather than the short term special interests of profit maximizing stockholders. 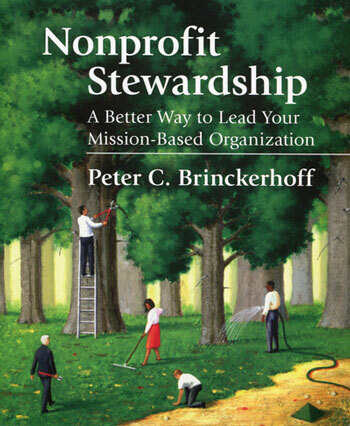 The image on the stewards icon is from the cover of Nonprofit Stewardship: A Better Way to Lead Your Mission-Based Organization, by Peter Brinckerhoff, 2004. Book publisher is Fieldstone Alliance, an imprint of Turner Publishing. Image used by permission. The book appears in the second Common Property Rights video about 25% into the video.